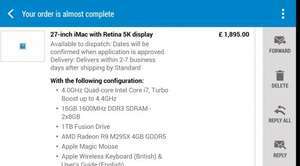 Latest Apple iMac direct from Apple using student discount (nus or Unidays) for £1895 as well as nectar points if you go for it through the nectar eshop portal. Sometimes nectar will have a triple points offer for Apple so have a look. Good spec, but isn't the 16gb ram an extra cost that would be cheaper if you bought your own ram to install? AMD M295X suffering from serious heat related throttling issue due to Apple's crappy cooling system. I find it bizarre that a machine costing nigh on £2k is offered at a discount just for students. How many students does apple think could realistically afford it?. Its £1759.20 using student discount? All iMACs have the student discount available.